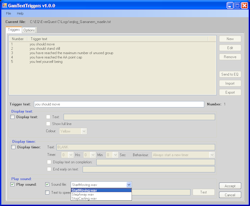 GamTextTriggers is an overlay tool which searchs for phrases in your log, when found will trigger a graphic or audio response. 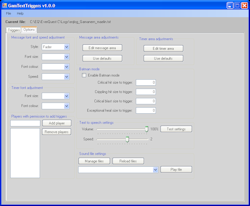 GamTextTriggers is similar to the in game audio triggers, but the result can be a timer counting down, a line of text flashed up on screen, playing an audio file, or using text-to-speech to speak some text for you. This program is ideal for those with hearing impairments or if you simply rather listen to music or voice chat, as well a way to set up triggers that are easily shared through import and export functions. The trigger editor has now been collapsed into a cleaner interface giving you the ability to perform multiple actions from a single trigger. With the editor, start by entering the text to trigger the actions you want below. From there you can select any of the actions, including using more than one of the actions. Enter the text you want displayed, or you can have the line that triggered show in full. For each display you can choose its own colour, so you can further enphasise some triggers, or just use colour to group types of triggers together, like Red for urgent actions, Yellow for regular actions and White for informational messages like being invited to a group. Timers can be shown with a count down of the time you had entered. Choose how to handle the same timer being triggered again. For actions that can only have one instance, like having the panther line of buffs on you, you would simply restart the existing timer. Actions that can occur to multiple targets of the same name would be best handled by creating a new timer for each one. Mezzing is a good example of this as you may mezz three creatures with the same name, so the same timer will be used for each. You can also choose to have a timer continue unchanged when a trigger is seen again. Set some text to be displayed on completion, for that extra enphasis when a timer completes, like a message telling you that one of your discs or abilities is available again. Finally, some timers may need to end early, so you can enter some text that when seen, will end your timer immediately. This may be for tracking an incoming complete heal, but you cancel the timer if you see the caster being interupted. This allows you to make your triggers more flexible, and to pull some of the information from the trigger into the result. Control how your messages are displayed and how timers appear. Place the windows to show where the timers and messages are to be displayed, including dragging them to a second monitor if you wish. Adjust the way the text-to-speech is handled, including volume and speed. Manage the audio files to use. Simply copy any WAV files into the directory provided to make them available to GamTextTriggers. Adjust settings for Batman mode if you wish to use it.